At a press conference on Wednesday, the Biloxi Shuckers revealed the official logo for the 2019 Southern League All-Star Game. The Shuckers will host the Southern League's annual All-Star Festivities on June 17 and 18 at MGM Park. "This logo captures the essence of the Mississippi Gulf Coast," said Shuckers General Manager Hunter Reed. "The history of the area is encompassed in the iconic Biloxi Lighthouse. The Biloxi Bridge symbolizes strength and perseverance in the face of adversity. It also signifies how bridges connect the entire Coast and bring people together, in same way this All-Star Game will bring Southern League and Minor League Baseball fans together for this joyous occasion. And the colors; blue, coral, sand and white, put Biloxi's signature stamp on the logo, selected as the colors of the Shuckers at the start of the franchise to display our Gulf Coast identity." 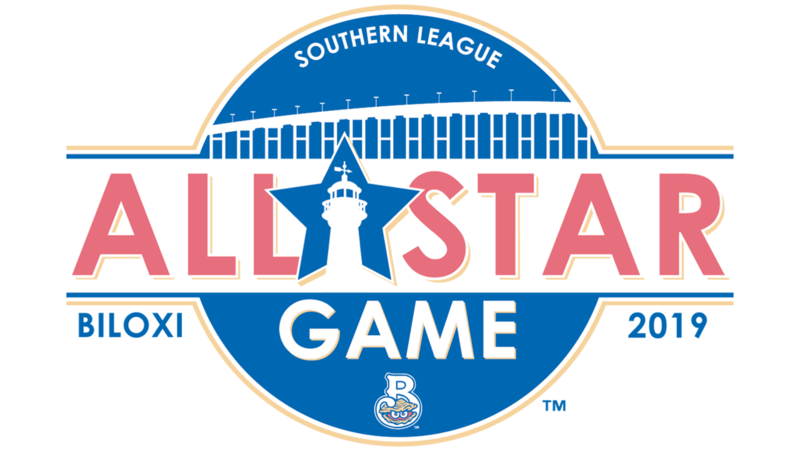 Instead of outsourcing the design of the logo, the 2019 Southern League All-Star Game logo was conceived by the Shuckers staff and crafted by Shuckers Marketing Manager Dani Polen. Merchandise will be available for purchase at the Shuckers Shop, located on the MGM Park concourse, beginning Wednesday. Further details for the 2019 Southern League All-Star Festivities will be announced in the coming weeks. The most up-to-date information can be found online here. First right to purchase All-Star Game Tickets can be guaranteed by purchasing a Shuck Nation Membership, and individual tickets will go on sale to the public at the beginning of March. Shuck Nation memberships and group outings for the 2019 Biloxi Shuckers season are on sale now and are available for purchase by calling 228-233-3465, online at biloxishuckers.com or by visiting the MGM Park front office. The Shuckers will open their fifth season at MGM Park on Thursday, April 4 at 6:35 pm against the Birmingham Barons.